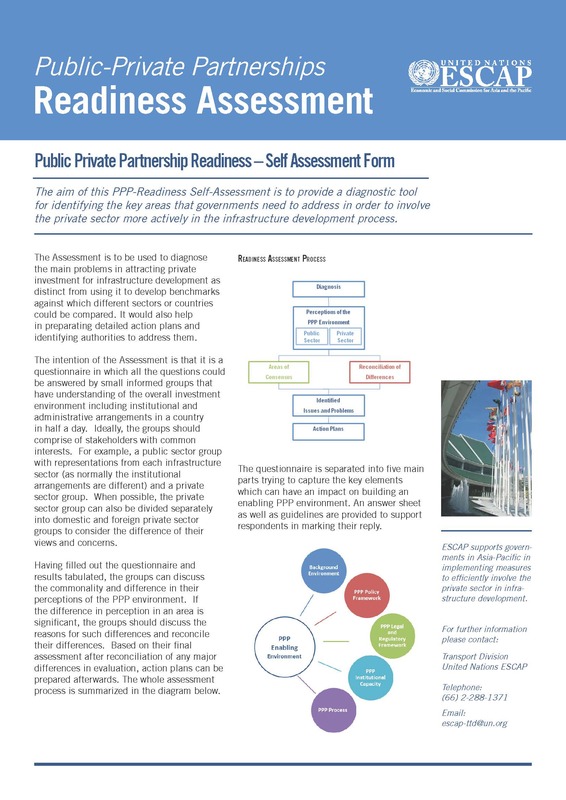 The aim of this PPP-Readiness Self-Assessment is to provide a diagnostic tool for identifying the key areas that governments need to address in order to involve the private sector more actively in the infrastructure development process. The key function of the Assessment is that it is to be used to diagnose problems in attracting private investment for infrastructure development as distinct from using it to develop benchmarks against which different sectors or countries could be compared. The intention of the Assessment is that it is a questionnaire in which all the questions could be answered by small informed groups that have understanding of the investment environment in a country in half a day. Ideally, the groups should comprise of stakeholders with common interests. For example, a public sector group and a private sector group. Having filled out the questionnaire, the groups can discuss the commonality and difference in their perceptions of the PPP environment. Based on their assessment, action plans can be prepared afterwards.